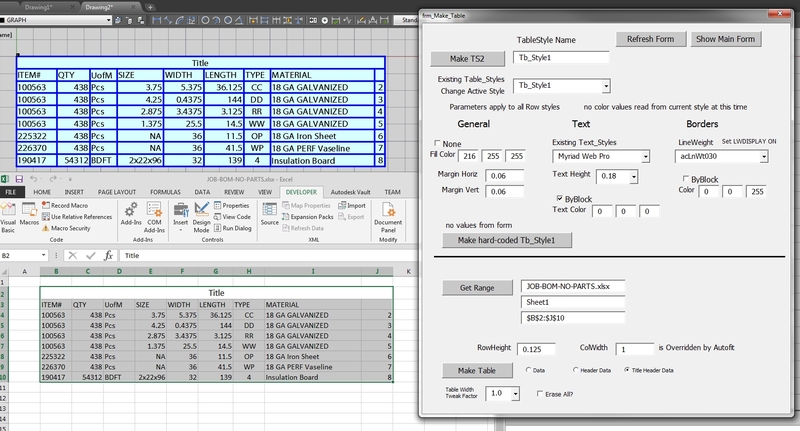 Autocad tables and VBA arrays have the same structure. You can make a sub procedure that takes an array passed as argument that makes an autocad table. The table sub can read the array and determine how many rows and columns it contains. The array is made in any sub specific to the task and separate from making or loading the table. The program flow can make just the data table without Title or Headers and add those later from other data. The simplest way to make an array is with the array function. The autocad method to Addtable requires 5 parameters. Rowheight and colwidth is up to you. To keep it simple use what generic table Standard supplies at first. numrows and numcolumns come from looking at the array upper and lower index. To make a table display a single dimension array in a single row. For our main 2 dimensional data table, we do the same thing but get table dims first. One issue that comes up on adding tables is the behavior of title and header rows. Another issue is when text overflows a single line and causes the row width to pop down. It pops down automatically, but not up. The cell width should be set before the data is loaded. This table sub is set up to only make data rows. The way it works though, the table is made with title and header rows, I dont think there is any way to stop that, and then the table object methods are used to modify the table. You might want to make the textsize of the title row the same as data in the table style manager, if you are using the Standard style. Otherwise depending on the data loaded, you may get a top row with a different height. After we get the table made, in real life we want to have our own tablestyle and probably do some formatting of the text before it is written to screen. I am just showing the data side here. 'the title row cell height may be larger than data rows. 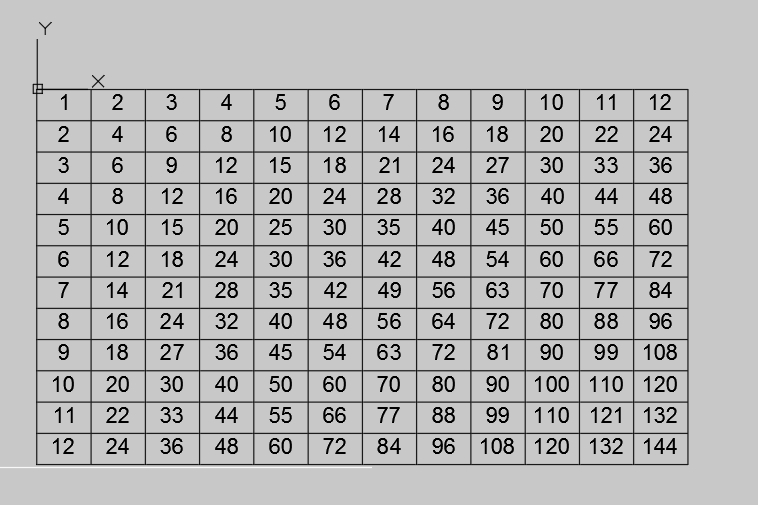 Here is a sub to make a multiplication table array with 12X12 hard wired in. You can experiment with different numbers and see if the table sub handles it. There is no title or header row. 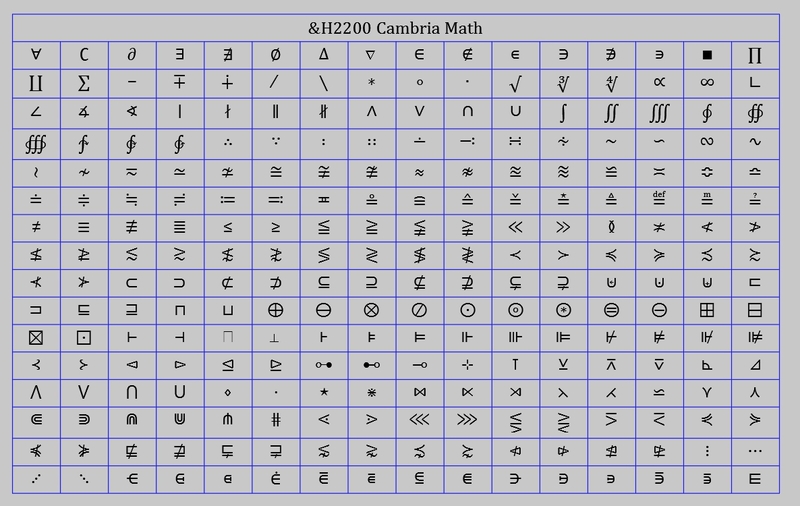 You can make a font table using ascii codes. Fonts use hex codes which are base 16. A 16X16 table displays 256 characters. After we make the data table we will add a title row and put the name of the font in it. It gets called as before but we are adding a title row after the data is written. Tablestyles have textstyles, so I am creating a new tablestyle each time using the current font name, and putting that font style name into the tablestyle to be used. Unicode is a long extension of ascii. There are many sections. You have to look up the hex code of the section you want to display. Header rows can be inserted just like Title rows. The header data can come from the Array command. The sub is similar to the 1D sub but even simpler. Acad Tablestyle can be programmed efficiently without duplicating code using a global variable for the Tablestyle object. While it is tempting to re-create the Autocad Tablestyle dialog in a VBA form, it would be difficult to improve on it and it would be a lot of work. The following program is a more or less full implementation of the tablestyle creation in code. Doubtless there could be some improvement of the variable listings, making them easier to create a list of standard tablestyles. This will do for a template in how tablestyles are made. an input form could interface with this style easily. TS.Description = TS.Name & " TableStyle"